Sorry, Efest 2-Bay BIO Charger V2 has been discontinued. The Efest BIO V2 has the option of variable charge rates that can be adjusted at will, so you can set the charge to how ever you see fit. 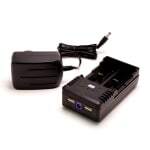 Featuring two independently powered bays, you can charge a pair of your favorite batteries quickly and safely. The Efest BIO V2 has the option of variable charge rates that can be adjusted at will, so you can set the charge to how ever you see fit. 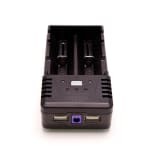 Featuring two independently powered bays, you can charge a pair of your favorite batteries quickly and safely. The integrated LED display shows the current charge status of each battery and indicator lights let you know what the current charge rate is. It's also equipped with dual usb ports and is prepped with over-discharge, over-voltage, short circuit and reverso polarity protection.